Soup may not be on everyone’s must make list as soon as Fall rolls around, but apple recipes usually are. 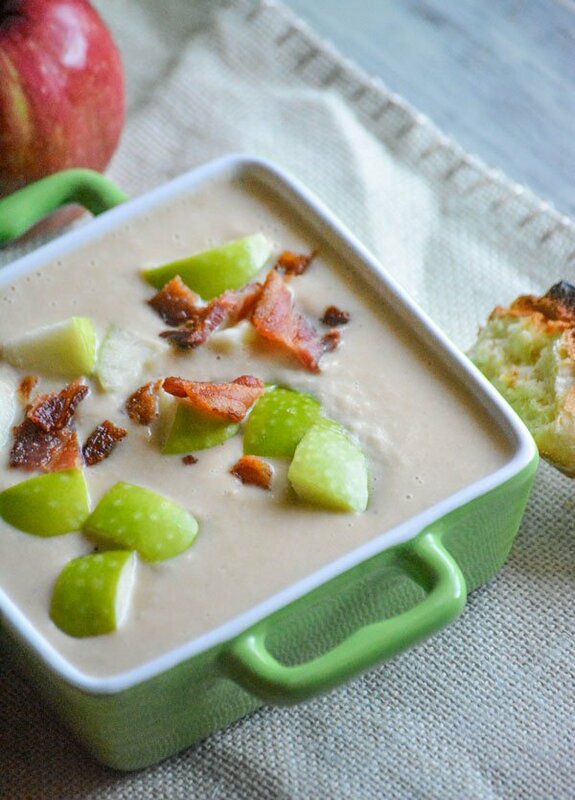 Combine the two by going with the classic sweet & savory pairing in this Roasted Apple & White Cheddar Soup. It’s a new way to throw all your favorite seasonal flavors into one perfect dish. Last week officially kicked off Fall. Which means our ‘holiday’ traditions have officially begun. Don’t mind us, we like to get in the ‘spirit’ of things early around here. The leaves change, and we’re off. Although this year we had to go more by the calendar than the weather, since the weather missed the memo that it’s officially Fall, not Summer. First up on our annual bucket list? The apple orchard. It’s a trek we all look forward to. Even our oldest still living at home took off of work, just so he could come on our family day trip. 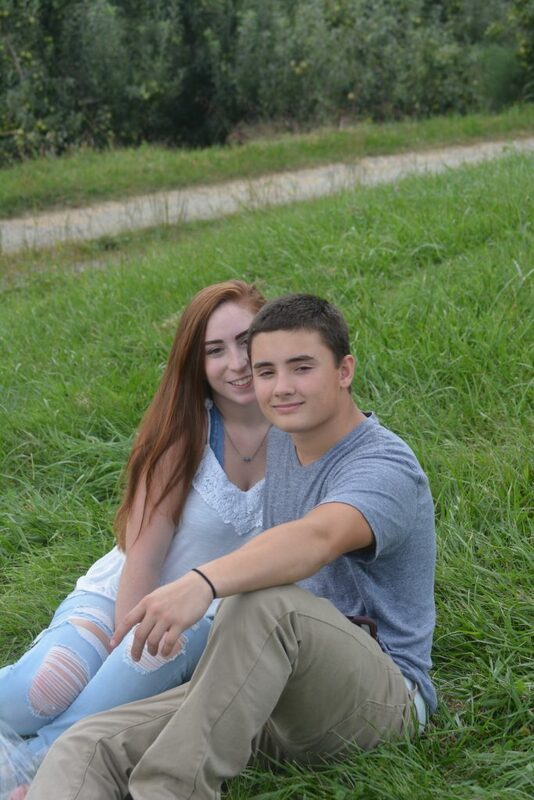 He even planned ahead so that he could bring his longtime girlfriend. My child, or at least this particular child of mine, planning ahead? Miracles do exist! I know most people go to and come home from the orchard with thoughts of warm apple pies fresh from the oven in their heads. I know this from the more than once I’ve had to bring back a bushel, or several, for friends and family for just that reason. Not this Mom, though. I mean, I appreciate them as much as the next person. I’ve even got a soft spot for my Grandma’s apple dumplings. Considering my massive lack of a sweet tooth, at the top of my list of recipes to try were of a more savory & sweet blend. Actually, I don’t totally lack a sweet tooth. I do crave a sugary sweet every now and then. The problem more accurately though, is that I only crave a bite or two– and then I’m done. I’m good, got my fill. 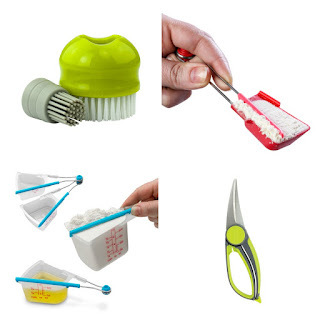 Which just isn’t very practical. I’m not trying to force my way through an entire dessert just because I don’t want it to go to waste. Even my guys would be hard-pressed to finish an entire apple pie by themselves, even with multiple scoops of ice cream. Back to that list I’d mentioned earlier, and not an apple pie in site. It is #AppleWeek though y’all, so we’ll be bringing you the best savory and sweet recipes we found this year- that aren’t Granny’s apple pie, or anything in that vein. First up? 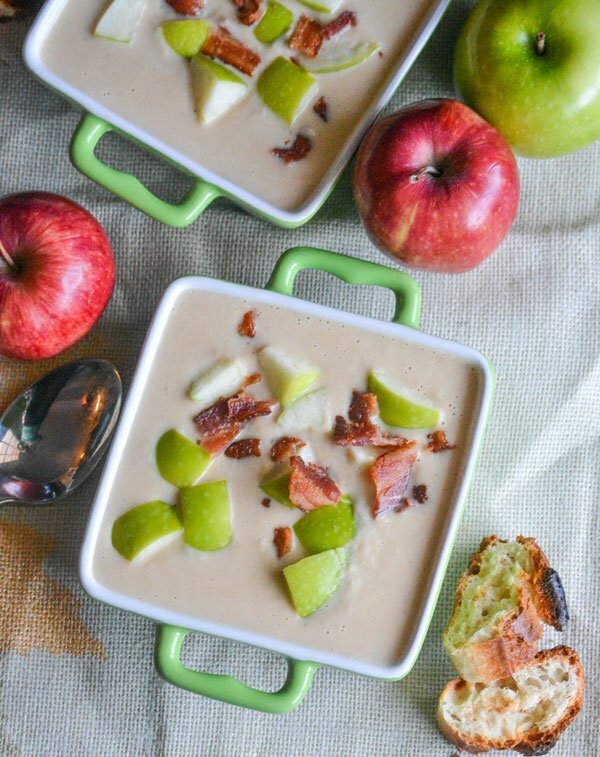 That’d be this dreamy Roasted Apple & White Cheddar Soup. If you haven’t had a dish that pairs sweet apple and tart cheddar together before, you’re in for a real treat. A creamy soup made with freshly roasted apples, hints of tangy aged white cheddar, and an inspired broth base infused with mustard and cider- Roasted Apple & White Cheddar Soup celebrates some of Fall’s best flavors. Ladle out a bowlful of Fall, top it with crisp crumbled bacon, juicy chunks of tart apples, and even a drizzle of maple syrup if you’re so inclined. It’s guaranteed to become a new seasonal favorite. 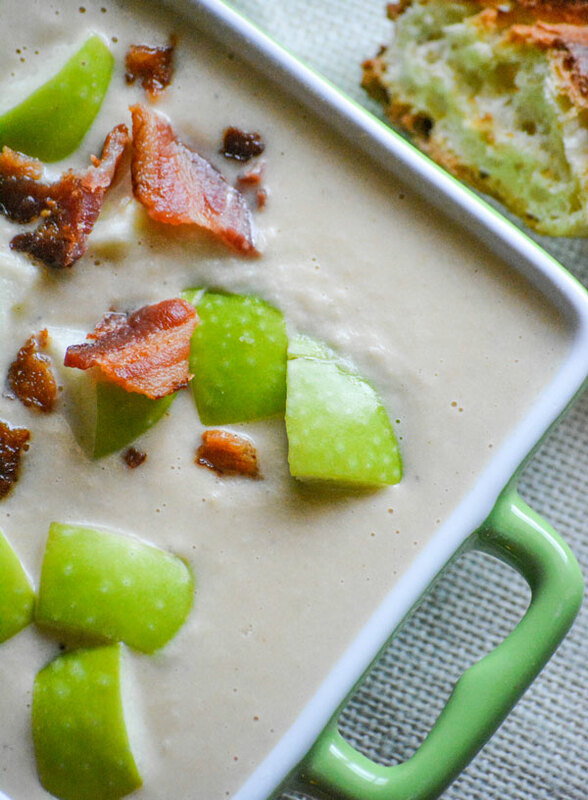 A sweet & savory soup that's perfect for colder weather, this one features tart apples, a bite of white cheddar, and savory bacon. On a large baking pan, toss together the apples, oil, salt & pepper. Roast them at 400 degrees for 25-30 minutes, or just until slightly golden brown. Add the onion to a dutch oven, or other large soup pot. Saute over medium heat, just until tender- about 5-7 minutes. Add the garlic and thyme, and cook for a minute to allow them to release their fragrance. Stir in the apples, broth, and cider and bring the mixture to a boil. Reduce the heat to medium low, and simmer for 15 minutes. Stir in the milk, cheese, and mustard until the cheese has completely melted and incorporated. Salt & pepper the soup, to taste. Use an immersion blender, or an actual blender (just be careful of the steam building up), and completely puree the soup. Ladle into bowls and serve, topped with crumbled bacon, tart chunks of apple, and the optional drizzle of maple syrup. Now, remember yesterday I let you know about #AppleWeek? I might have mentioned it once or twice today. There’s big chances to win some awesome prizes/packs. 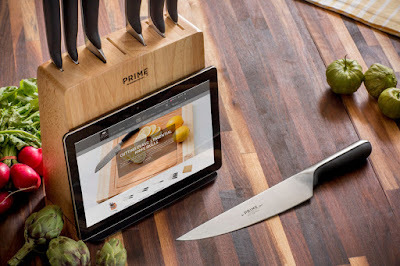 Scroll through to see what’s up for grabs, and enter to WIN! A baker’s dream come true! This delicious prize pack includes premium vanilla products, gourmet dutch-processed cocoa and specialty extracts. Pure Vanilla Extract, Gourmet Dutch-Processed Baking Cocoa, Gourmet Vanilla Extract, Madagascar Bourbon Vanilla Beans, Organic Vanilla Extract, Organic Chocolate Extract, Almond Extract, Vanilla Paste, and some fun baking supplies to whip up your next batch of goodies with! 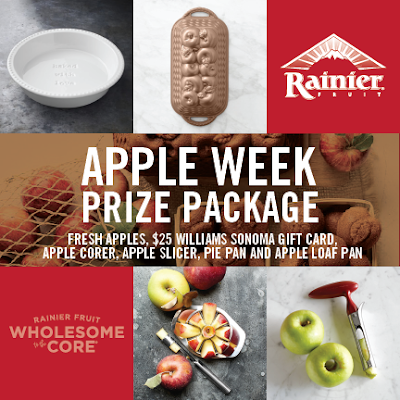 A prize pack from Rainier Fruit including a box of freshly farvested Rainier Fruit apples, a stainless steel apple slicer, apple corer, “Baked with Love” ceramic pie pan, copper apple loaf pan and a $25 Williams Sonoma gift card! I’m interested to try this – love all the flavors! They may seem odd together at first, but they bring out the best in each other! 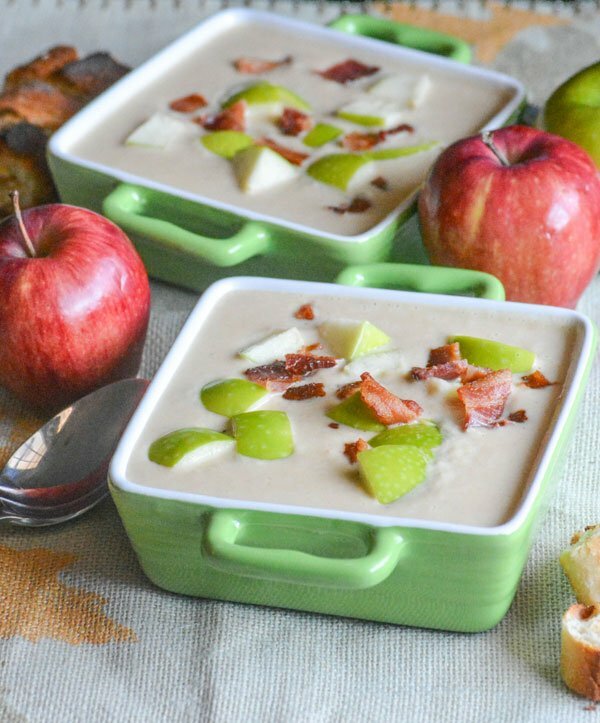 Oh my…..I am drooling here…..and then the apples and bacon topping…..swoon. Yes, Wendy! It’s enough goodness in one bowl to bowl you over! What a fun idea! 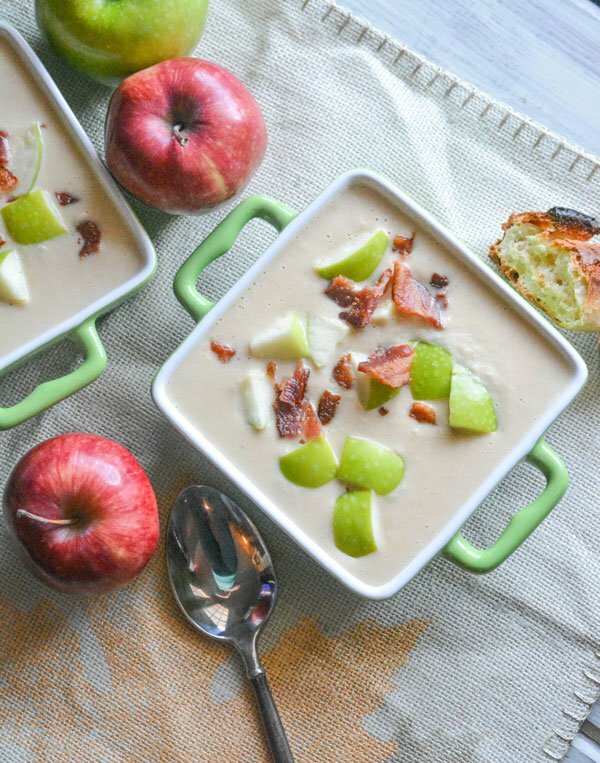 Soup and apples happen to be two of my fall favorites so I can’t wait to try them together! They pair together beautifully, Carlee. You won’t regret it! I love the sound of this soup and the texture looks perfect! My husband requested soup this week and we’re doing a carrot one, but next week I think I’ll be having to give this one a try! 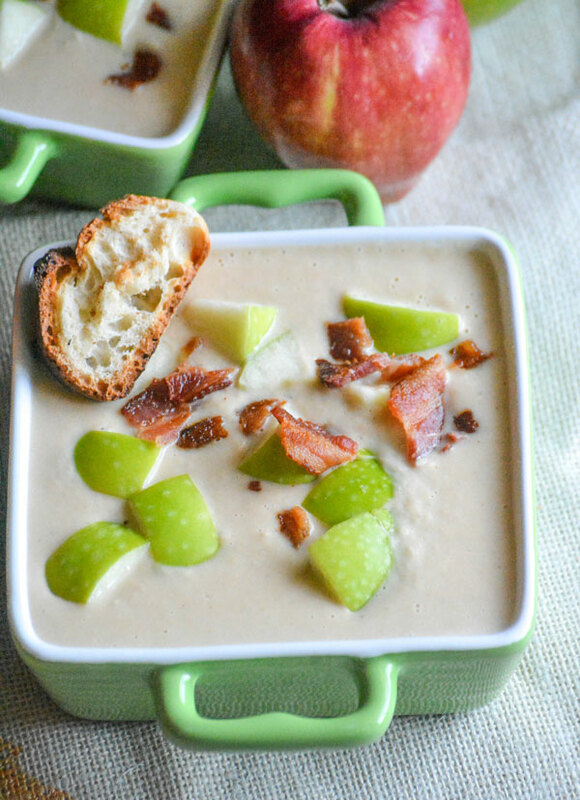 I am so interested in this combination of cheese, soup, and apples. It looks so intriguing and tasty! Everyone at Fiesta Friday will love this creative fall soup! Thanks for sharing and Happy FF!